The Free online Flipbook Creator can convert PDF or Images (JPG, GIF, PNG, etc) to HTML5 Flipbook with page turning animation effects with simple steps. Using the free online Flipbook Maker, you can make flipping online magazines, e-books, e-newspaper, online catalogs, and other publications without any programming skills. Convert your PDF into an interactive, realistic Flash & HTML5 flipbook in minutes. Convert your PDF into an interactive, enjoyable digital flip book in minutes. Create your digital magazines, catalogs, brochures, reports, newsletters and other marketing content with modern interactive features. Unlimited publications, Secure and reliable hosting. Publish online, offline or USB/CD/DVD/EXE/ZIP/APP. Going mobile – HTML5 & Jquery & CSS3 flipbook. Rich media – audio, video, link, SWF and more. Tons of flash animations, scense and effects. Never before was it this easy to create a eye-catching publications. Just import your PDF and input your text, images and video in the page editor and you’ve a digital magazine that you can share with everybody. Engage your customers with branded, commerce-ready digital flipping book, catalogs, lookbooks, magazines & other online publications. Easily upload your PDF publication to PUB HTML5 and in a matter of minutes get your digital magazine up and running. Yes it’s that easy! Use the upload button to try it yourself now. LotDOC HTML5 Flipbook Maker is a powerful digital flipbook maker software which does not only support PDF files, but also supports almost all office format, including *.doc; *.docx; *.ppt; *.pptx; *.xls; *.xlsx; *.odt; and so on. It is convenient and easy to convert images to a HTML5 digital flipbook & catalogs, which makes your static images more attractive and dynamic. 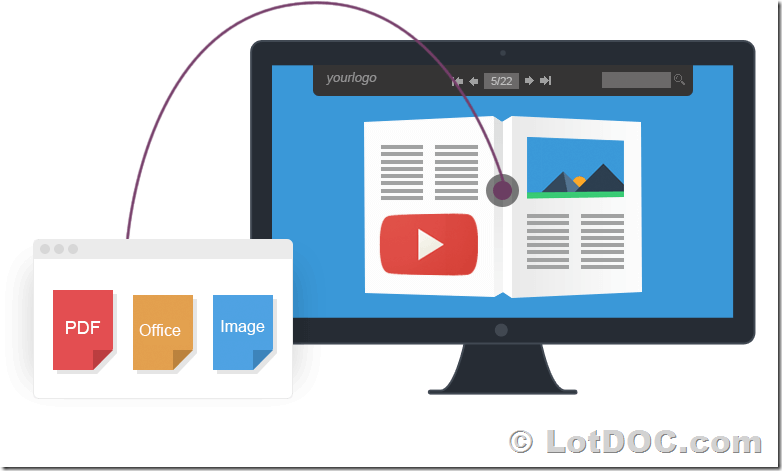 LotDOC HTML5 Flipbook Maker supports nearly all kinds of image formats: *jpg; *.jpeg; *.png; *bmp.